The tool is specially programmed to move The Bat! mail to Outlook without any restriction. Moreover, The tool allowed user to migrate any number of accounts configured with The Bat! email application in a very effortless way. While exporting The Bat! file the software also retains the attributes associated with each file such as size, date, location, etc. The Bat! to Outlook migrator application is compatible with all Windows OS, including Windows 10. With the help of The Bat! converter tool, a user import messages from The Bat! to Outlook 2016, 2013, 2010 & lower editions. 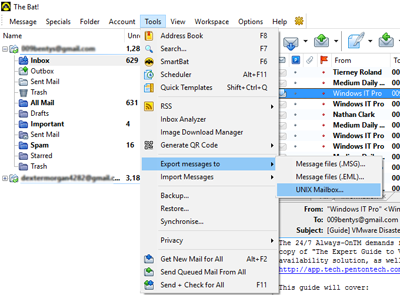 While exporting emails from The Bat!, the tool maintains the folder hierarchy, original formatting of the data. Moreover, a user can export multiple emails from The Bat! file to Outlook without any risk of loss data, as the software retains the integrity of data as well. The BAT! Email application provides users an option to save The BAT! Mail file into format. With the help of this option The Bat! user can save mail into file. After that, use the The BAT! to PST converter tool, to move all saved files to PST files. Moreover, The tool provides option for user to export multiple The Bat! Mail files into a single PST file. The Demo Edition of the The Bat! to Outlook Wizard will export 10 email into Outlook PST. Can I export The Bat! TBB file to Outlook PST format? No, The software will export saved file of The Bat! email client. I want to convert The Bat! to PST format, But I am not able to find the location of The Bat! mail file? Open The Bat! Email client, and select email which you want to export. Then select Tool option from the menu bar, then select "Export message to" then "UNIX mailbox". Select location where you want to save file. The Bat! Mail converted into file. Now, you need to use our The Bat! to PST exporter tool to convert The Bat! Emails into PST format. Then import PST file into Outlook email client. I am able to modify the The Bat! messages after importing them into MS Outlook? Yes, After exporting emails from The Bat! to Outlook, you can edit the importted message by double clicking in the message and go to Action button that contains Edit Message option. Does the software allow to export multiple The Bat! Mail to Outlook at one time? Yes, The software allow user to convert mail from multiple The Bat! accounts at one time. One just needs to choose the Convert All Identities option, The Bat! Mail to Outlook migration tool will migrate all the accounts to Outlook without ant trouble. Can I export emails from The Bat! email client to Outlook along with attachments using your utility? Yes, The Bat! converter tool is designed in such way that it exports all emails along with attachments from The Bat! to Outlook without any problem. Moreover, it also preserves the attributes associated with each attachment. Does the software allow users to export only selective emails from The Bat! Mail to Outlook? Yes, if a user wants then he can export only items that are important ones. One just needs to check the checkboxes corresponding to each data items that he wants to export. "I tried many time to migrate from The Bat! to Outlook manually, but did not get satisfactory results. After that, I came to know about this The Bat! to PST Exporter. I must say that it is an ultimate utility that exports all my The Bat! emails to Outlook PST format without any restriction. Moreover, the software has an easy-to-use interface that I liked the most. Thanks to the developers for developing such a great application." "It is a great application that I have tried ever to perform email client migration. The best part that I liked about this tool is that it convert multiple The Bat! File into a single PST & provides an option to split large size resultant file. Moreover, if a user wants can migrate multiple accounts configured with The Bat! to Outlook at once using this The Bat! to PST Migrator. Great effort was done by the developers."